Our team are asked this very question on a daily basis. The answer however is not as straight forward as one might think, with our canine counterparts varying so much in lifestyle and personality, we need to be able to assess them on a more individual basis. For example, your average healthy middle aged dog should be able to manage between 30-40 minutes twice daily without issue. This would be the same regardless of breed size, thus dispelling the common myth that smaller breeds don’t require as much exercise. Some individuals may comfortably manage up to an hour twice daily if conditioned to this level of activity, but more than this shouldn’t be maintained unless our dogs are used to it, and trained appropriately to avoid premature wear and tear. 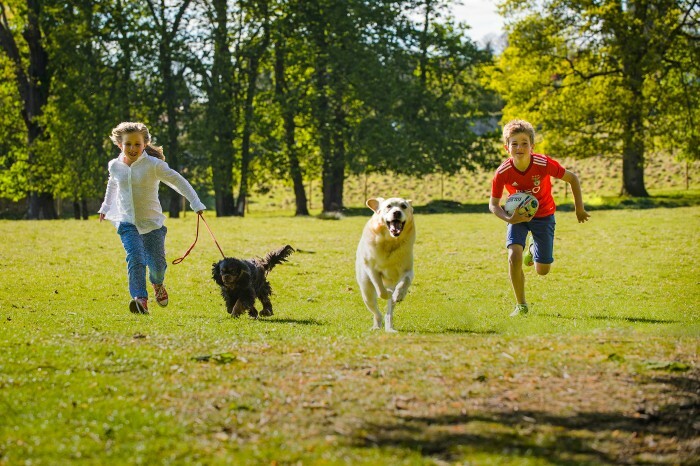 We routinely find that companion dogs are walked considerably longer and further at the weekends, when perhaps the family unit has more time available to spend together. If we consider this in terms of our own level of fitness as a human being, being used to 10 minutes here and there during the course of the week will not prepare our body for the exertion of hours of exercise at the weekend. Unfortunately this does mean we often see a higher incidence of injury in these animals, we wouldn’t expect ourselves to manage a marathon without training after all! With that being said of course, an older animal or perhaps one that has orthopaedic or arthritic considerations, may be much more comfortable on a “little and often” routine of exercise. Walking more regularly but importantly for shorter periods at a time, keeps the joints strong and flexible, as well as limiting the damage and pressure placed on the musculoskeltal system. An ideal schedule for an arthritic animal should be up to 15 minutes at a time, 3-4 times daily. It should be noted that we consider a dog “geriatric” when they are older than 7 years of age. In these instances our dogs may have a considerable portion of their lifespan left to enjoy, but it wouldn’t be a bad idea to monitor them closely and limit their walking/playing as required. At the opposite end of the spectrum, puppies are slightly more complicated. During skeletal development, the fusion of growth plates, joints and indeed bone growth aren’t completed until maturity is reached, meaning that any period of over-exertion can cause long-term damage. Severe injuries at this point in development can limit growth, and lead to life-long conditions requiring similarly life-long treatment. With “over-exercise” in mind, a general rule of thumb is to apply 5 minutes, low-impact lead walking to current exercise routines per month of age. As a starting point, this would mean at 8 weeks a pup shouldn’t be walking for longer than 5 minutes at a time, twice daily, whereas a 6 month old may be used to 30 minutes without issue, twice daily. To throw a spanner in the works, different breeds mature at different rates. Smaller breed pups can reach full development in as little as 6-8 months, whereas medium sized breeds are often “done and dusted” just in time for their 1st birthday. Large and indeed Giant breeds often don’t reach maturity until 18 months – 2 years. When it comes to age of maturity, a puppy shouldn’t be running for prolonged periods before they reach this critical age, growing body systems are fragile and, much like human toddlers, we should try and reign them in for their own good where we can. In summary, a difficult question can be answered with good sense and a fixed routine. If your dog is comfortable within a stable, consistent exercise routine, and displays no signs of stiffness or lameness, the likelihood is that you are doing well. Otherwise, if you are in any doubt or have a younger dog to consider, please don’t hesitate to make an appointment with one of our nurses for more advice.